Bearing the title of a Gold Star mom comes with the heaviest of burdens. 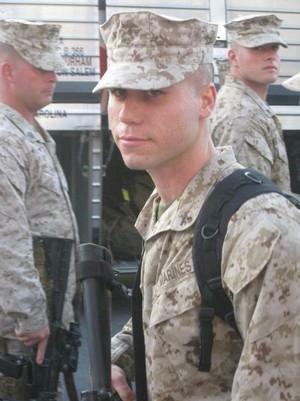 On March 22, 2010, my son, a U.S. Marine, was killed in action in the Helmand Providence of Afghanistan. Justin was just 24 years old. Surrounded by his family, Justin was blessed to have those all-important last hugs and kisses before boarding his bus for deployment. In hindsight, I didn’t realize how very important those few last minutes meant. For me, it was the last time I would ever see my son. It is those minutes I will cherish forever. Those precious moments with his family were extremely important to Justin; this was evident in his posture, voice, and in his eyes. His last words to me will ring in my ears through eternity: He said, “I woke up to loud noises coming from outside my barracks and went to take a look. I saw people cheering with flags and banners as the buses from a previous deployment were coming home. I never felt more proud to be a Marine.” As he was saying this he was staring at the faces of other men and women who weren’t as lucky – they had no family present. Suffice it to say that the financial burden was too great on these families to make the trip to see their loved ones off. They boarded this bus alone. He said, “I need to know you’ll be here when I come home, cheering with flags and banners. I want that feeling again, promise you’ll be here for me. I love you.” I did, and I was, unfortunately not the way he or I planned. Until that fateful night when I got that unforgettable knock on my door, it hadn’t occurred to me just how important Justin’s words were. Bravery is what he possessed; I possess the passion to honor his memory by helping families of other enlisted men and women in our armed services. It is with that spirit that I have created the Memorial Foundation. This non-profit organization’s sole purpose is to raise funds which will be used to supplement or pay for transportation of family members to either see off and/or greet their returning service men and women upon their return. There is no doubt that each of our service men and women deserve to have what my son had; last minutes before deployment that were filled with hugs, kisses — being surrounded by loving family members. In this light, I am asking for your support towards this honorable cause. Please visit our Donation page by clicking here. We appreciate any assistance that you may offer. Please remember all donations are tax-deductible and the money raised will directly benefit our service men, women and their families. With a donation of any amount you are helping a Mother kiss her son or daughter good-bye, just one last time.